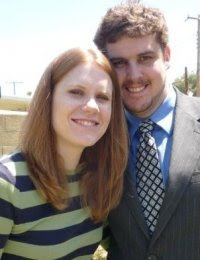 Karl Hermann came into my life about 14 years ago, when he took a job as the drumline instructor of my marching band. I thought he was really cute and tried to get him to notice me, but he was not interested in looking at high school girls. The next year though, I realized he at least noticed me enough to recognize me at the institute building at MCC. We hung out quite a bit my freshman year, but never really hooked up. We reconnected on facebook in August and got together to catch up. We both knew immediately that there was a connection between us. Odd timing, but went for it anyway. 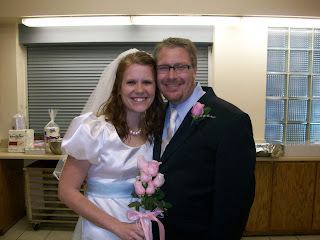 These are photos from our wedding on October 17. 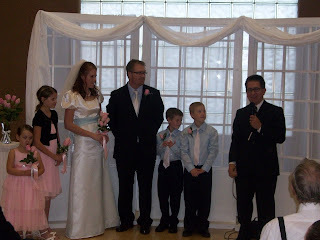 It was so neat to have the kids be a part of our wedding. It was a special day for our whole new family. Cameron taking one of his many water breaks. I am coming out to everyone who reads my blog. I asked for help, but now I just want to share the pain. NO, I am not a lesbian. But I am a bulimic. I have started telling people because I need help. I know people think, well just stop, Sara. Believe me, I have tried to just stop, but I can't. This is bigger than me. Its not like when I just stopped drinking those heavenly delicious frozen cappucinos. This is bigger than that and I need help. Let me just describe the fight that goes on in my head every day. I wake up and think, should I eat breakfast or just skip it. Usually I decide to skip it until I get to circle K and get a twenty cent banana and a diet coke. No problem, those are less than 150 calories. Okay, I can handle 150 calories. No big deal. Then lunch comes around, I am weak and tired and shaking because I need to eat. So I go to Circle K and look through every isle examining how many calories each item has and decide on 90 calorie lunch meat a bag of pretzels and maybe another banana. That's almost 400 calories. I get back to work and scarf it down because I am starving and shaking. Okay, I am good. About twenty minutes later, I start panicking and worrying about my hips getting bigger or my thighs. I try and calm myself and say, it's ok. You can burn it off later on the elliptical. But then I think, What if I don't have time tonight to work out? This fight goes on in my head after every meal. I finally give in and down a liter of water, wait about a minute and then go and empty my stomach. Relief from the fight in my head. Relief from the fear of gaining weight. But not relief from the torture to my body. Cameron has stepped up to be the man of the house. Kenzee's training wheel broke off. So while I was at work, Cameron found Jeremy's tool box. Got out the wrench and took of the training wheel frame part. I drove up from work and found them outside "fixing" the bike. Too cute! I had a dream about Jeremy Sunday night. He was porceline looking and I knew he was an angel, but I hugged him and I could feel him as if he were there and not in my dream. His chest was bare and it was perfect. Scar free and perfect. He told me he would never leave me. And he gave me the courage to make the change in my life that I needed. 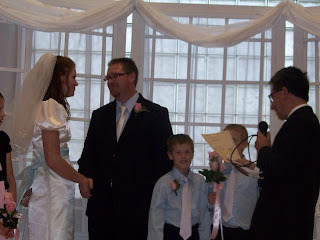 I have been so scared to raise my four kids alone that I rushed at the speed of light, into a marriage that neither of us was ready for. I know I am not alone in raising my babies. I have so many wonderful friends. I have my parents and I have Jeremy helping from above. I never have enough energy for them, but I do have enough love. Thank you so much to everyone. Jill, thank you for calling me all the time, it seems, right when I am falling apart, you are always there. Emily, thank you so much for texting me at all hours of the night. 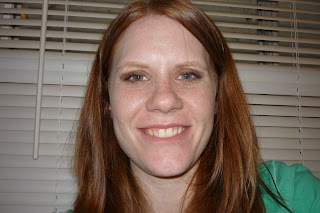 Tiffani, thank you for dropping everything and getting my kids because they are scared of the lightning. Rebecca, thank you for not saying "I told you so", even though you had every right. Mom and Dad, thank you for everything. David, thank you for loving me enough to leave me. 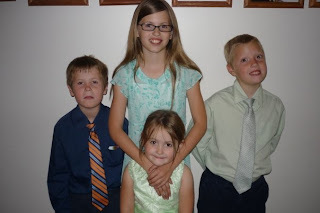 Most of all thank you Melodee, Brandon, Cameron, and McKenzee for being forgiving of your crazy mother. I need to grieve Jeremy's loss. I never did. I just went numb. I need to be Sara, and I need to take care of myself. The banana cake is Cameron's. The seven layer bean dip and Tostitos are David's. First of all, I went camping once when I was four or five. I don't remember it at all. That was the only time my family went camping as a kid. We never went again because it was a horrible experience. I didn't go to girls camp. I am not a roughing it kind of person. I live in Heber/Overgaard. Life is camping to me. So.......My boys birthday was Saturday, July 11. For their birthday last year, we took their cake and few presents down to the hospital and spent it with their dad in his hospital bed. Grandpa Jim wanted to make this a better birthday for those boys. HE DID! They won't ever forget it. Friday, Jim came and picked the kids up at about 11:30. David waited for me to get off of work and we drove up together. It rained Friday night so we all slept in the fifth wheel. Early the next morning, Jim took the twins fishing at Reservation Lake. Mel and I went for a jog around the woods. We got back and got ready and went to look for the boys. We drove around for over an hour looking for them. Of course there was no service for our cell phones so we never found them and went back to the trailer. They showed up about an hour later and said they went to a different lake. Cameron was whining because he didn't catch any fish, but Brandon caught one. They ate it for dinner that night. David wasn't feeling good and I didn't sleep a wink the night before, so we took Kenz and Camme home. Mel and Brandon stayed with Grandpa and they slept Saturday night in a tent. Camme was worried about bears so he wanted to leave. Grandpa and Brandon didn't get attacked by a bear, just an elk. Brandon caught a total of three fish. So we know who will save us from starvation. They want to go again. Thank you Grandpa Jim!!! Girls night out rules!!! Jill and I went and saw Angels and Demons. During the movie, Jill got up to go to the bathroom. When she came back, she had a new drink. I thought hers ran out and she bought another one. She sat down and turned to me and said,"Why are there three drink cups?" She was drinking someone elses cup that she found in the bathroom. We both wanted to throw up!!! SICK! I cannot make up my mind....obviously. So we moved back to Heber on Saturday May 30. I am back at A1 Glass. David is looking for a job. Melodee is back in summer music at Capps. 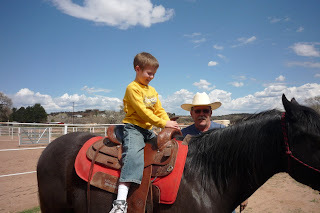 The boys are going to go back to Mountain Meadows in August for 2nd grade. (I can't believe they are that old) And Kenz is back to being the spoiled baby. We are not living in the same house as before. We are renting a different place over on the other side of the boys school. It is so nice to be in our own place again. It feels like we are a family again. We are still having emotional issues, pretty much ALL of us, but we are working through them. It is easier to remember who you were, when you are surrounded by reminders. Today started out being boring....until Jill showed up at my work and we got our diet sodas together. JILL I am so glad you are back from CA!!!! (even if you aren't) You made my day! That morning lasted forever. Time had no meaning. A huge part of me died that morning too. I have been trying to figure out who I am for the past six or seven months. I have made so many mistakes since that day, trying to run away from the pain. I cannot explain the intense pain that comes from losing your soulmate. But, I know that the crazy decisions that I have made have hurt those who I love the most. I am so sorry. I am so grateful for your continual love dispite the choices I have made. I don't want to do the things that remind me of Jeremy. I need to do those things again, like go to church. My kids are starting to notice that they want that back in their lives. Cameron asked me this morning to go to church. Thank you to Grandma, my mom, for giving them that stability that they needed when I was unable/unwilling. So I just need to vent again on this Mother's Day. It was a good day. My kids were super sweet with their cards and hugs. I loved them! Cameron even wrote a card in Spanish. How cute......I just have been feeling again. The numbness has wore off. I have been being really short fused with everyone I know. It hasn't been fair. I haven't been being fair to anyone. 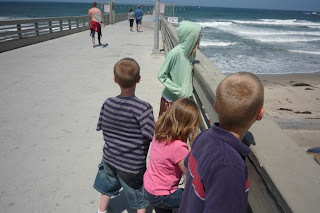 The kids on a pier. 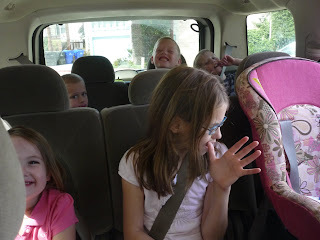 All six kids being shuttled around San Diego. SIX KIDS!!!! That is craziness!!!! I am so mad that my batteries died in my camera. I only got these three pictures. We had fun at the beach. 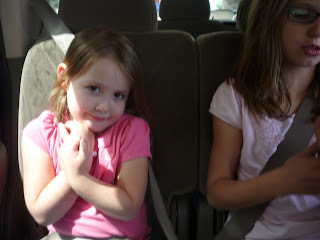 We had fun going to see the Hannah Montana movie with all SIX KIDS. David and I needed a psychiatric exam afterwards but it was still fun. 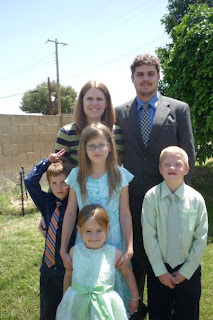 Our family Easter pictures. My boys are so anti picture takers. They always look so goofy in pictures. Our first family pictures. David looks dang good in his suit. We went out to dinner, Beck and Ryan, my Mom, Jake and Megan and Me and David. We went to Carrabas. Here is my mom just thinking that dinner was so lovely and Ryan being lovey. Okay Jake! He was really enjoying his pizza. Cameron making a shot. He is playing at the YMCA jr. suns basketball. Here are a few details about our super fast wedding. We were originally going to get married in September. A few things changed, obviously. 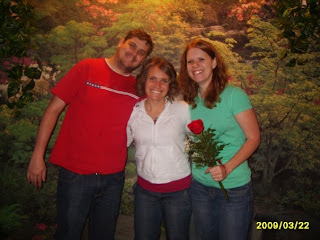 So we were going to elope somewhere in AZ, but I really thought Vegas sounded like a fun time. Anyway, it sort of happened so fast. 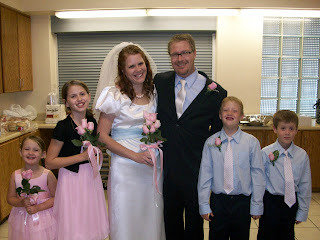 I was on my way to Cottonwood to pick up David and I got a phone call from my sister in law, Laurie. She was asking if she could come to my wedding and I was so dang excited that she would drive down from SLC to be there. She brought my two neices, Bridgette and Maise. Laurie was our witness and that is why the picture is posted. After I got off the phone with Laurie, my phone died. 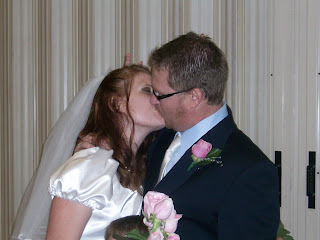 I didn't get all the texts and voice mails until later that night, after I was married. We were going to get dressed up, but ran out of time. So that is why we look like we traveled all day instead of nice and fresh and ready to get married. We got married about 11:00 pm. 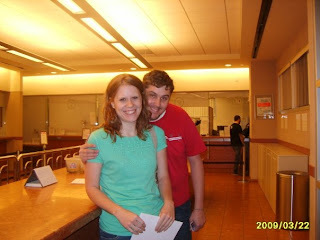 In the first picture, we are at the court house getting a license. The couple in the background were at the same wedding chapel as us too. Laurie was there witness too. She made the night so fun. After that all five of us went back to the hotel we were staying at, Luxor, and finally ate dinner. We were oddly entertained by these dancing men in a cage. I could totally dance better than there chest bumping action....Actually Laurie had their dances down pat. The next morning all five of us went to the M&M factory and the Coke store. We got a few things for the kids and of course matching Coke shirts. What else would we drink? So life has calmed down a bit. Not much else to say. I watched the Biggest Loser tonight and I realized that I need to become a Biggest Loser again. I kind of plateaued on my weight loss. I just have those last pesky ten pounds to go to be at my goal. But hey, I will get there. 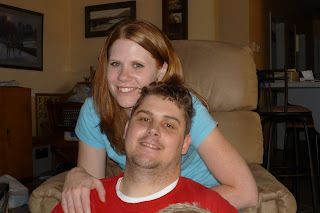 Today for our weekly family fun day we went up to Cottonwood to visit my boyfriend, David King, and his family. We had so much fun together. David's two children were there too so we were kind of like the Brady Bunch with three boys and three girls. But it was still a really fun day! 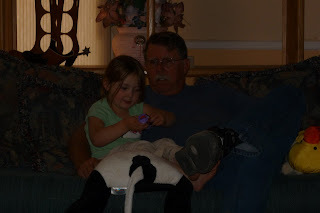 Kenzee seems to always have an immediate bond with the grandpas. This is David's dad, Jim, holding Kenz while she talked his ear off about some toy she was holding. Jim has a horse named Harley. 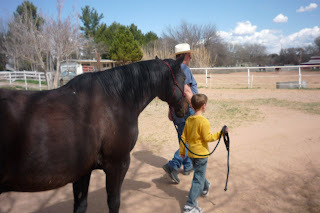 He was kind enough to take me and the kids to ride it and groom it. 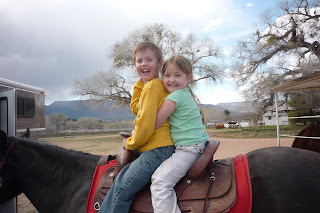 Melodee and Cameron didn't want to leave the Wii, so it was just Brandon and McKenzee and me that got to ride the horse. So cute! Kenzee was too scared to even get on the horse until I did it first.